Jurassic Lake, ie. The River Camp at the bay at the outlet of Barancuso River is the greatest wild Rainbow fishery in the world! 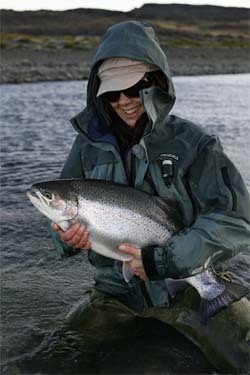 After several exploratory trips in 2006, full programs from Nov 2007 to April 2008, we are very confident that a visit to Jurassic Lake will change anything you thought you knew about rainbow trout and you will leave with memories that will last a lifetime. This is the only place we have heard of where guests have fainted due to catching too many fish! Some visits to the gym before getting here is recommended. The lake is nothing else than a biological sensation and contains millions upon millions of fresh water shrimp (krill, scuds). The fish grow to huge sizes eating only the protein-enriched shrimps all year around. This is simply the most Omega-3 fat fish you have ever seen. Yes, it’s possible to eat and taste during the stay. We have also seen that the rainbows are making their way into the small stream (the only stream in the lake) to spawn nearly all months of the year, as long as the river has water. All we can gather is that the vast numbers of rainbows has created its own ecological system and its unending food source has pushed these fish to “year-around-spawners”, depending on water level in the small stream that feeds the lake by the Loop River camp. Arriving at Jurassic Lake you will quickly realize just how far removed you are from the real world, as the shear vastness of this secluded country is beyond belief. The large lake is roughly 20 km by 15km, situated approx. 1000m over sea level, and looks more like a saltwater body of water with its crystal clear blue water and channels, corals and shelves. Our first exploratory trip had us casting into this huge body of water with little to no expectations. After being broke off a half dozen times we quickly realized there was something strange going on here. These huge fish are much, much more then just abnormally large, as they are pound for pound one of the strongest fish we have ever seen. The blood curdling runs are only interrupted by jumps that often involve leaps far above your head. 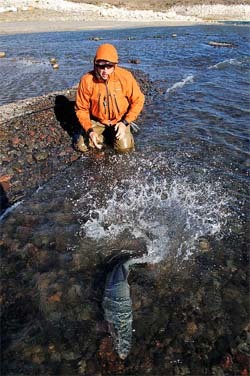 Do not put your hands anywhere near your reel handle, as you will surely risk loosing some skin or even break a finger. The camp consists of comfortable safari style dome tents with wooden floors, 3 wood beds with mattresses and new warm sleeping bags per dome. We now also have new wooden cabins with heaters and wooden beds with new warm sleeping bags. A Dining tent, one shower tent and one storage tent makes up the rest of the camp. A small generator makes it possible to load batteries. The camp is only 2 minutes walk from best fishing places which makes this by far the best location around the lake! Our guides are a combination of chefs, camp managers and guides. They will show and give advices on the fishing but fishing will mainly be done without a guide on your side all the time. Fishing is so obvious so it is not needed. They will cook, clean the camp and help out with anything needed. It is hard work in the middle of nowhere so we hope all can accept this.